In her journal, Rose writes "good riddance" to 1934, but it's the middle of the Great Depression and, sadly, 1935 isn't going to be any better. She writes about surviving the dust bowl, about events on their farm in Kansas and throughout the nation, about the skinny cattle and her family's struggle to keep their land. It truly feels like it's told from the dust bowl children POV! Publisher's Weekly called it a "well- researched account" and School Library Journal said ""Moss has done a fine job in research, and there is quite a bit of historical information packed into this short book." And teachers will love that it includes some ideas for related activities for kids. 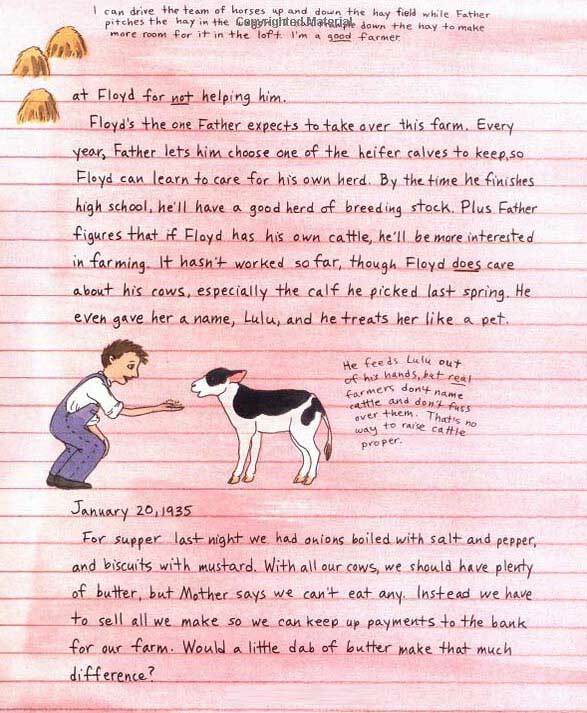 Children will learn so much from this journal! 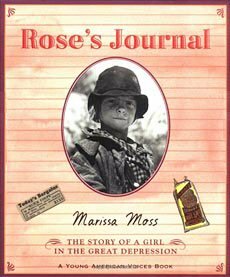 Marissa Moss has done a great job of weaving dust bowl facts, emotions, and experiences into little Rose's writing -- all those little daily details of surviving the dust bowl. Kids will walk away feeling like they really know some actual dust bowl children! 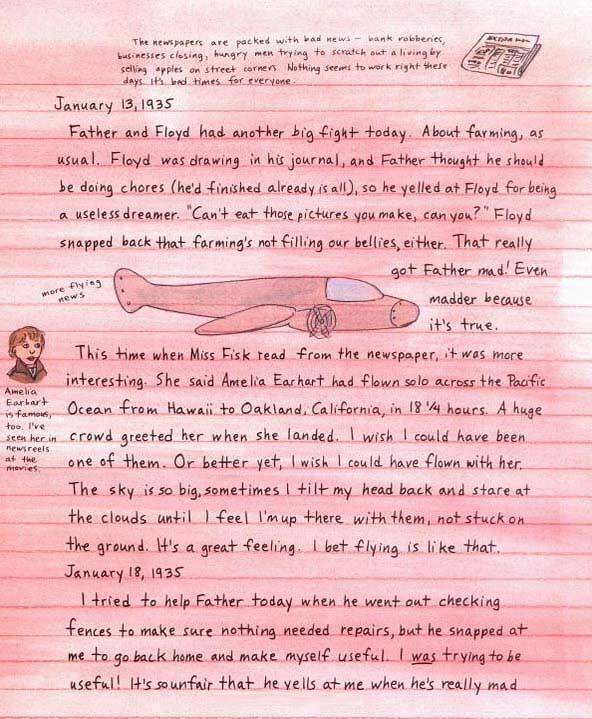 Here are sample spreads from inside Rose's Journal. Marissa Moss does such a good job of covering a very scary topic --SURVIVING the Dust Bowl -- but in a kid- centered, less scary way. 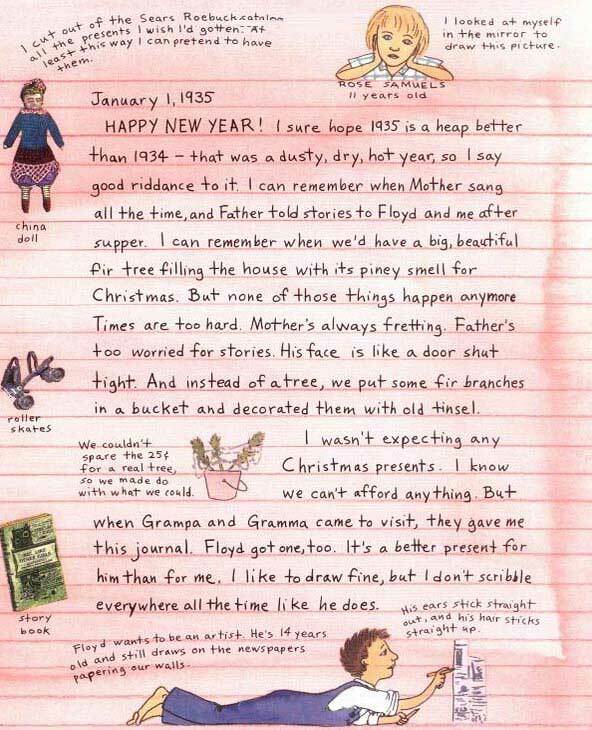 We think it really does seem like dust bowl children have written their own account (complete with little sketches).